Bruce Willis was born on a U.S. military base in West Germany. He came to America at the age of two, when his father was discharged from service and his family settled in New Jersey. As a boy, Willis was a stutterer, a speech impediment he overcame through acting -- with study and rehearsal, the stuttering disappeared, and eventually it faded away off-stage as well. After high school, he worked as a truck driver and did other odd jobs, before deciding to go to college and make something of himself. He briefly studied drama at Montclair State College, but dropped out when it bored him. Willis took a slummy apartment in New York, where he worked odd jobs. He shared an apartment with another struggling actor, Linda Fiorentino, and made his film debut as an extra in The First Deadly Sin, with Frank Sinatra in his last leading role. He replaced Ed Harris in Sam Shepard's off-Broadway play Fool For Love in 1984, then flew to Los Angeles when he thought had an inside track on a part in Madonna's Desperately Seeking Susan. 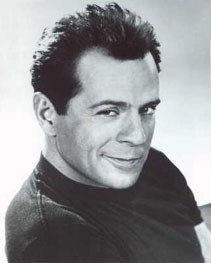 He didn't get the role, but ended up co-starred in Moonlighting, opposite Cybill Shepherd. His sparring with Shepherd made the series a big hit, and when the show ended after four years, Willis was the big star, Shepherd the afterthought. He has gone on to star in blockbusters like Die Hard, Pulp Fiction, Armageddon, and The Sixth Sense. He has also starred in some of Hollywood's biggest bombs in recent decades, including The Bonfire of the Vanities, Hudson Hawk, The Last Boy Scout, North, and Billy Bathgate. Willis was fired as celebrity spokesman for Seagram's when he was arrested for drunken driving. In 1987, he was arrested for disturbing the peace and assaulting a police officer when a party at his home got out of hand. Charges were dropped after Willis apologized to police and his neighbors. He is a co-founder of Planet Hollywood, and loudly supports Republican candidates. He was one of Hollywood's most outspoken supporters of the 2003 war with Iraq, and visited the troops there, offering a $1 million bounty for the soldier who captured Saddam Hussein. When Hussein was captured, it turned out that military rules prevent troops from collecting such a reward. After a long, high-profile marriage to movie star Demi Moore, the couple divorced in 2000 but remain friends and are frequently seen together. Like most of Hollywood's "it" boys, Willis has a band (The Accelerators) and considers himself a rock'n'roller. His 1987 cover of "Respect Yourself" made the top ten.